Inventory – Utilizing GIS, mobile mapping and boots-on-the-ground inspection (where required). 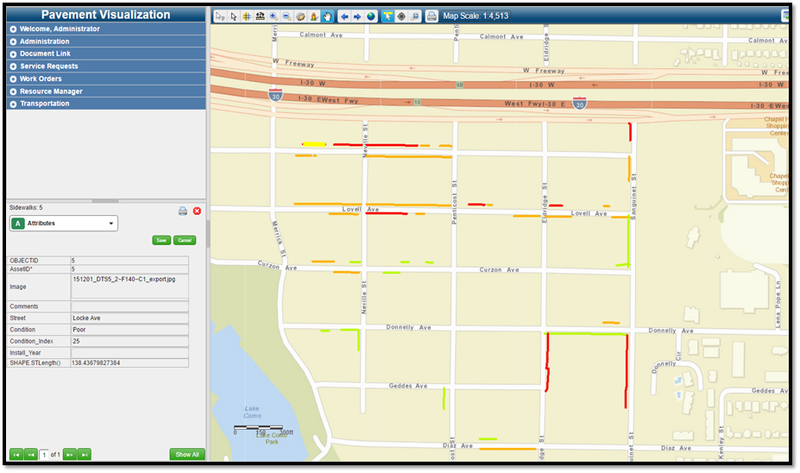 Assess – Visually inspect infrastructure assets and quantify their compliance. Prioritize – Develop a list of high-risk assets that need immediate attention. Execute – Re-construct, upgrade or maintain infrastructure assets that are part of an annual work plan. 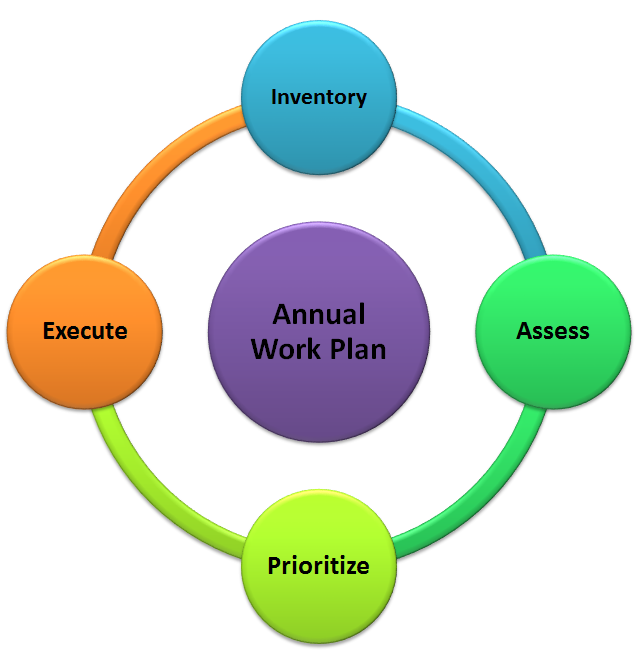 Rinse and Repeat – Execute work plan annually and re-assess the network of assets every 3-5 years to update the plan. How many miles of sidewalk do we own and maintain? What kind of condition are our sidewalks (asphalt or concrete) in? How many curb ramps to we own and maintain? Where are we missing curb ramps? Where are our compliance issues located? By collecting this initial inventory information, an agency can start to develop its internal plan to gain compliance over time while developing a budget to help achieve this plan. The assessment procedure involves a series of steps that are both automated and manual, depending upon the technology used to conduct them. In most cases, mobile data collection is used to conduct the initial assessment of the assets and then a more rigorous boots-on-the-ground approach is used to fill in the gaps (obscured assets) and to collect data that requires precise measurement such as slope information (Ramps) and trip hazards (Slab faults and Cracks). This approach saves both time and money because it is basically a visual assessment that identifies major (Risky) issues and highlights areas that need immediate attention. Therefore, an agency can lower their risk of litigation by taking measures that focus on short-term, high-risk assets while still providing support for the assessment of longer-term (lower Risk) assets. 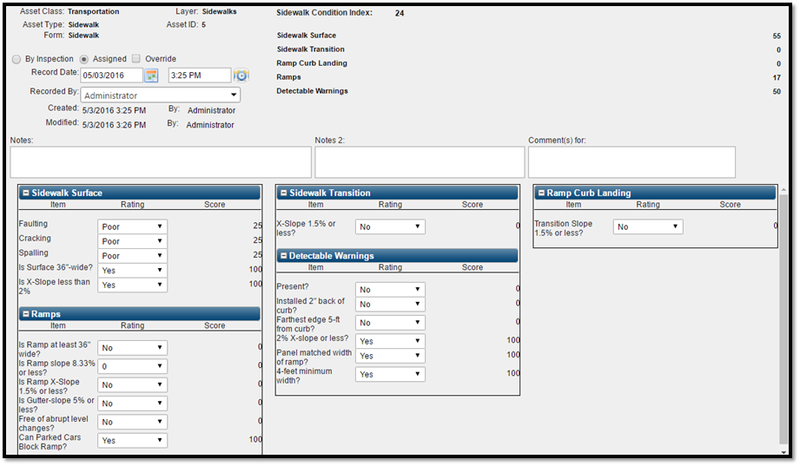 The assessment process can be facilitated within the VUEWorks Asset Management system through the utilization of the Condition (Inspection) module. 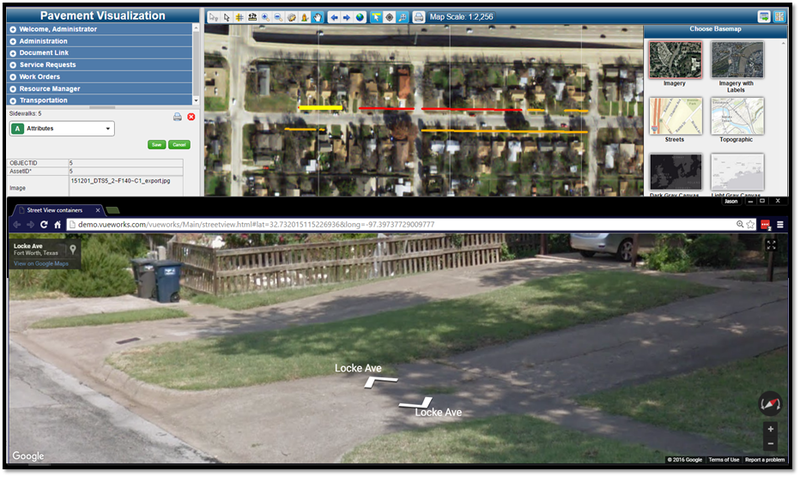 As the inspector views the right-of-way imagery, they can record the assessment in a configurable condition form that is designed to record ADA compliance. The form below illustrates how different Items can be inspected and divided into specific categories. Each “Category” can be further broken down into specific inspection “Items” that can contain some kind of Condition rating (1-5, Good, Fair, Poor, 0-100, etc). Each of the individual Items can then be queried individually or combined into an aggregate score by Category and then further rolled-up into an Overall Condition Index for the Asset. 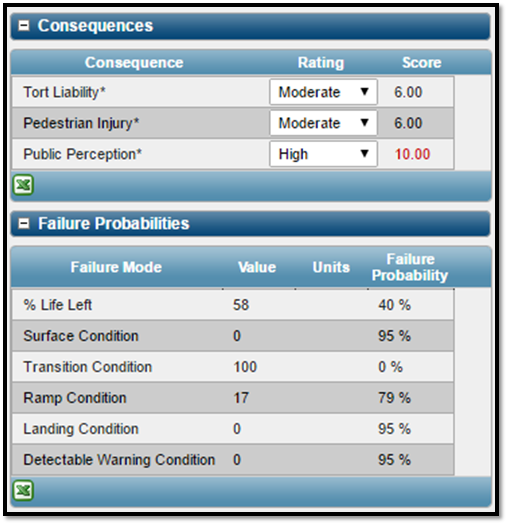 Once the Condition score is generated, the resulting Condition Indices can then be symbolized in the GIS as a visual representation of the Sidewalk/Ramp condition. VUEWorks also provides some useful tools, including integration with Esri Basemaps (ArcGIS Online) and Google StreetView. VUEWorks provides the ability to assess Risk based on the criteria that matter to your organization. For example, would you go and fix a sidewalk or curb ramp on a road that was travelled by someone with a disability? Or, would you spend that money elsewhere? Risk can help you prioritize WHICH asset to fix and WHEN to fix it based on many different criteria. For example, an agency can look at a few different things when determining WHAT to fix and WHEN to fix it. They can observe the Consequences of Failure (What happens IF the asset fails) and the Failure Probability (Likelihood of Failure). As illustrated in the graphic below, the Consequences of Failure can be measured and rated for different categories. The Failure Probabilities can then be rated based on “How” an asset fails, or its Failure Modes. Each Failure Mode can contain a different Probability of Failure which allows the agency to understand what the Influencing Failure Mode is when determining what type of maintenance to prescribe for that particular asset. 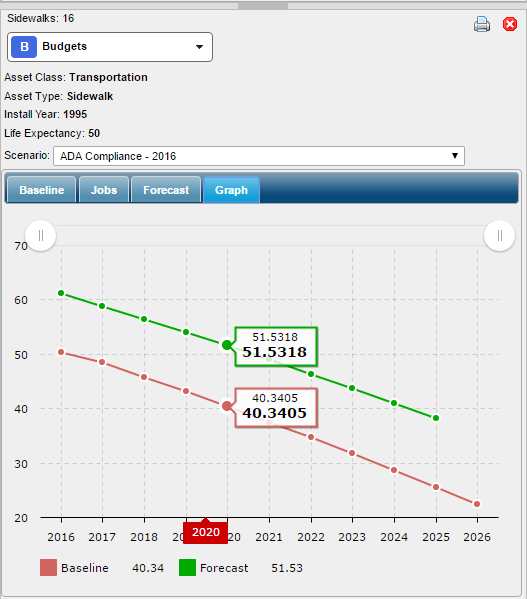 The Budget Forecasting tool in VUEWorks allows user to develop “What-if” scenarios to plan and estimate the cost of projects based on the application of specific Jobs. Projects can be prioritized based on the Failure Probability, Risk Factor, Criticality Factor or any combination of the above. Once a project is involved in the plan, its Baseline Condition and the forecasted Condition can be viewed over its life cycle. All of this information can be used together to develop a Strategic Asset Management Plan utilizing the Intelligence gained for each individual asset the agency maintains. At the end of the day, we understand that ADA compliance is a balancing act where limited resources are being applied against assets that are critical to the operation of an agency’s transportation network. Although other critical infrastructure (Pavement, Signs, Signals, etc.) usually get the bulk of the funding, it is time to focus a portion of these resources against assets that are critical to the safety of our disabled citizens. The Americans with Disabilities Act of 1990 (ADA) prohibits discrimination and ensures equal opportunity for persons with disabilities in employment, State and local government services, public accommodations, commercial facilities, and transportation. Final regulations revising the Department’s ADA regulations, including its ADA Standards for Accessible Design was published in the Federal Register on September 15, 2010 (corrections to this text were published in the Federal Register on March 11, 2011). ADA covers all state and local governments, including those that receive no federal financial assistance. While the ADA has five separate titles, Title II is the section specifically applicable to “public entities” (state and local governments) and the programs, services, and activities they deliver. The Department of Justice (“DOJ” or the “Department”), through its Civil Rights Division, is the key agency responsible for enforcing Title II and for coordinating other federal agencies’ enforcement activities under Title II. DOJ is the only federal entity with the authority to initiate ADA litigation against state and local governments for employment violations under Title I of the ADA and for all violations under Title II of the ADA. Title II of the Americans with Disabilities Act (ADA) requires that state and local governments ensure that persons with disabilities have access to the pedestrian routes in the public right of way. An important part of this requirement is the obligation whenever streets, roadways, or highways are altered to provide curb ramps where street level pedestrian walkways cross curbs. This requirement is intended to ensure the accessibility and usability of the pedestrian walkway for persons with disabilities. What is the Difference between Maintenance or Alteration? An alteration is a change that affects or could affect the usability of all or part of a building or facility. Alterations of streets, roads, or highways include activities such as reconstruction, rehabilitation, resurfacing, widening, and projects of similar scale and effect. Maintenance activities on streets, roads, or highways, such as filling potholes, are not alterations. Treatments that serve solely to seal and protect the road surface, improve friction, and control splash and spray are considered to be maintenance because they do not significantly affect the public’s access to or usability of the road. Some examples of the types of treatments that would normally be considered maintenance are: painting or striping lanes, crack filling and sealing, surface sealing, chip seals, slurry seals, fog seals, scrub sealing, joint crack seals, joint repairs, dowel bar retrofit, spot high-friction treatments, diamond grinding, and pavement patching. 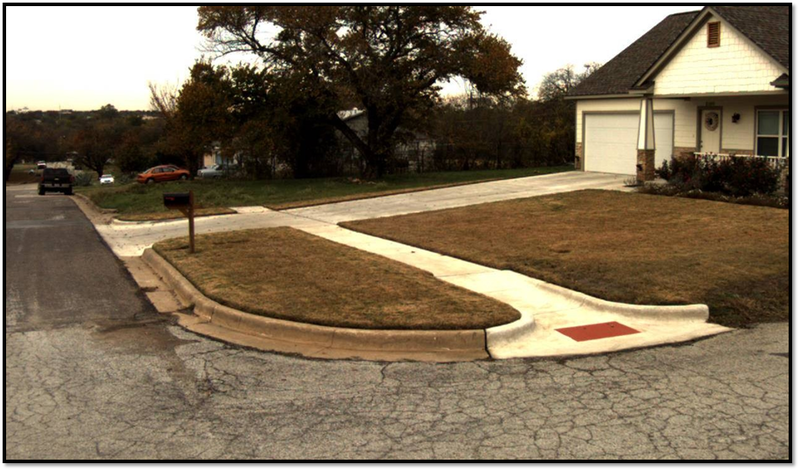 In some cases, the combination of several maintenance treatments occurring at or near the same time may qualify as an alteration and would trigger the obligation to provide curb ramps. ADAAG: Required on curb ramps, hazardous vehicular areas, and reflecting pools, but not on doors to hazardous areas. The warnings must be truncated domes (§4.29). UFAS: “Tactile warnings” (uses different terminology) required only on doors to hazardous areas. Must be a textured surface on the door handle or hardware (§4.29). As a Public Agency, How Should I approach Compliance with Limited Resources? Public agencies are constantly chartered with conducting business and doing “more with less”. This includes achieving compliance with Federal Mandates that require infrastructure investment, but do not provide a funding mechanism to support it. In the industry, we call them “unfunded mandates”. The existing infrastructure is non-compliant and therefore requires significant investment to bring it into compliance. Agencies do not have the ability to pay for the infrastructure enhancements required to achieve compliance. Agencies are hesitant to assess their compliance because if they document problems, then they feel obligated to fix them. Therefore an attitude of “If I don’t know how bad the problem is, I can ignore it for the time-being…” becomes pervasive throughout many of these Public Entities. By “not knowing” how non-compliant their agency is in regards to this requirement, the agency is actually creating more litigation risk for itself. At VUEWorks, we have developed an ADA-compliance methodology that utilizes GIS and Risk-based prioritization to develop a long-term plan focused on ADA compliance.